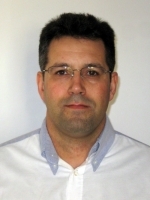 Luís Oliveira received the Electrical Engineering Diploma, the MSc degree in Electrical Engineering and the PhD degree in Electrical Engineering, from the University of Coimbra, Coimbra, Portugal, in 1995, 2001 and 2014, respectively. In 1996 he joined the University of Algarve, Portugal, where he is currently an Adjunct Professor. His research interests include modelling and simulation of power transformers, condition monitoring and diagnostics of power transformers, and protection systems. PhD, Electrical Engineering, University of Coimbra, Coimbra, Portugal, 2014. MSc, Systems and Automation, University of Coimbra, Coimbra, Portugal, 2001. Licenciatura, Electrical Engineering, University of Coimbra, Coimbra, Portugal, 1996. Gago, N. J. V., ''Reducing Current Harmonic Distortion by Using Paralel Active Filters: Analysis for Several Non-Linear Loads'', Supervisor: Oliveira, L. M. R., University of Algarve, Portugal, 2015. Rafael, F. M., ''Numerical Differential Relay for Power Transformers Protection'', Supervisor: Oliveira, L. M. R., University of Algarve, Portugal, 2015. Best paper award (field of Energy), 4th IFIP WG 5.5/SOCOLNET Doctoral Conference on Computing, Electrical and Industrial Systems, DoCEIS 2013.